Former professional football player Warren Harold Moon is best known as one of the earliest African American quarterbacks in the National Football League (NFL). In 2006 he was the first black quarterback inducted into the National Football League Hall of Fame. During the 1989 season, Moon earned a five-year, $10 million-dollar contract extension with the Houston Oilers, which made him the highest paid player in the NFL at that time. Warren Harold Moon was born on November 18, 1956 in Los Angeles, California. His father Harold was a laborer, and his mother Pat was a nurse. Moon was the middle child surrounded by six sisters. After his father’s passing, when Moon was seven, he became the family caretaker, learning to cook, sew, and iron. Moon decided to play the quarterback position soon after joining the Pop Warner League for football players under the age 16. He became the quarterback at Alexander Hamilton High School in Los Angeles and, during his senior year, he helped the team reach the city playoffs. Moon attended West Los Angeles College in 1974-75 where he continued to play quarterback and then enrolled into the University of Washington in 1975 where he became the first black quarterback in the university’s history. At first Moon faced boos, death threats, and taunts from the restless fans hungry for wins at Husky Stadium. The team went 11-11 under Moon’s leadership in his first two seasons. During his senior year he led the team to a 27-20 win over the University of Michigan in the 1978 Rose Bowl, and was named the game’s most valuable player. The University of Washington Huskies finished the season rated #10 by Associated Press and #9 by United Press International. Despite that success, Moon went undrafted in 1978 by the NFL and consequently made the decision to play football for the Edmonton Eskimos in the Canadian Football League. There he threw 144 touchdowns, 77 interceptions, and 21,228 passing yards. He played in five consecutive Grey Cup championships (Canada’s equivalent to the US Super Bowl) between 1978 and 1982. In 2001 he was enshrined on the Eskimos Wall of Fame for 2001 and was an inductee into the Canadian Football Hall of Fame. The NFL finally recognized his talents, and individual teams launched a bidding war when he chose to return to the United States in 1984. 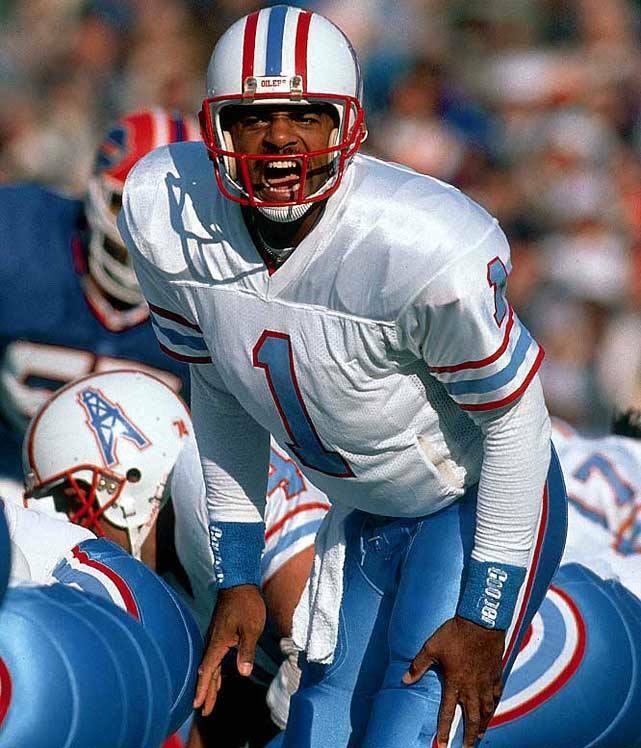 He chose the Houston Oilers (now the Tennessee Titans) and, during his nine years there (1984-1993), he threw 291 touchdowns, 233 interceptions, and 49,325 passing yards with a QB rating of 80.9. He was selected to nine pro bowl games, and was the 1997 Pro Bowl MVP. In a single year, 1990, Moon was selected all-AFC, the NFL MVP, and the NFL offensive player of the year. The NFL rewarded his off-the-field accomplishments: he was NFL Man of the Year in 1989, Walter Camp Man of the Year in 1993, and Bart Starr Man of the Year in 1994. After leaving the Oilers in 1993, Moon played for the Minnesota Vikings (1994-1996) and then with the Kansas City Chiefs from 1997 to 2000. He retired from professional football in January 2001. Warren Moon is currently a broadcaster for the Seattle Seahawks.